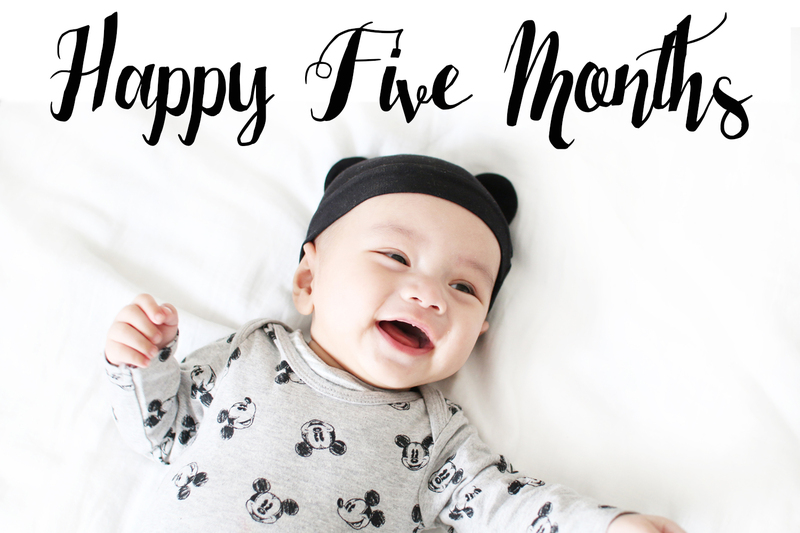 Five months? Holy Moly. Time is flying by and before I know it I will be picking him up from school, well - not really but you get what I mean. My little man is blossoming each day and his personality is really starting to show. He is still as happy as ever, eating well, sleeping well and constantly farting. Which I know is a good thing, he's letting off the extra wind inside him. It doesn't bother him at all and he sometimes farts in his sleep, which makes me chuckle. He's becoming more vocal, louder and higher pitched. He often squeals when he's super excited, which makes me burst into laughter. He's constantly rolling around too which means he's no longer taking naps on the sofa and as a result, we've bought a extra large activity mat for him to roll around on. I have started weaning him. I know many say wait until 6 months and some start at 4 months, each to their own. Aiden was more than ready to try his first spoonful of puree. He is on his second week now and doing really well. His favourite is sweet potato, apple and carrot. As you can imagine, my mornings are now spent, cooking, blending, packing and feeding. I aim to cook all of his food unless it's really inconvenient and we're forced to buy off the shelf. He has had all of his jabs, he took his last one like a king. I hate to come across as that 'smug' mum but honestly, he really has been a easy and outgoing baby so far. I feel like mums are constantly judged. Moan about your baby and your unappreciative. Praise your baby and your THAT 'smug' mum who's baby can't do no wrong. It shouldn't be this way. Anyhoo, I can't wait for the next few months. We are thinking of going on a holiday, close by - somewhere in Europe. And best of all, it's Summer! I can't wait to get out of the house more, do more activities and generally enjoy the longer days. So adorable! I'm glad you and your family seem so happy. in applications Watches Replica and on-demand of Apple and Android smartphones. iOS and Android applications, simple, easy-to-understand Replica Rolex Watches graphical highlight week or the day of the month, at how much people sleep touches. The purpose of this way, to Designer handbags contribute to human happiness, in order to obtain a better understanding of its own, it is adapted to handbag replica encouragement coach. And better sleep, more active lifestyle wide, simple, and is believed to UK Replica watches.